that dominated the Japanese imperial court in Kyoto from its establishment as the capital in the late 8th century until the rise of the Shogunate in the 12th century, at which point it was eclipsed by the daimyo. The kuge still provided a weak court around the Emperor right up until the Meiji Restoration, when they merged with the daimyo, regaining some of their status in the process, and formed the kazoku (peerage), which lasted until shortly after World War II (1947), when the Japanese peerage system was abolished. Though there is no longer an official status, members of the kuge families remain influential in Japanese society, government, and industry. The word means literally "public house" or "public family" and originally described the Emperor and his court. The meaning of the word changed over time to designate bureaucrats at the court. 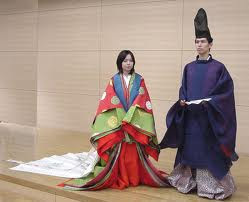 During the Heian period the relative peace and stability provided freedom for the noble class to pursue cultural interests, and the Kuge became leaders and benefactors of arts and culture in Japan. Most of the Kuge resided in the capital city of Kyoto. Seigake (清華家): could be appointed daijin (minister), including daijō-daijin, the highest of the four daijin of the court. They were descended from the Fujiwara clan or Minamoto clan, descendants of the emperors.
. WKD : first day of the rat, hatsune 初子 . This hokku was written in the 5th month (June) in 1815, when Issa was at one of the hot springs in Yudanaka (about 20 miles east of Issa's hometown) as the guest of the owner and his son, who were also renku and hokku poets and followers of Issa. The hokku is part of a series of hokku in Issa's diary about an important festival: judging by its placement in the diary, it was written on lunar 5/5 to celebrate the Tango Festival, the Children's Day Festival. The festival was held shortly before the summer solstice, originally to pray for good health during the coming hot months, when disease was more common. In the Edo period the 5/5 festival was often referred to as Women's House (onna no ie), since women put leaves of sweet flag (similar to iris) and other grasses in the eaves and took hot baths in the evening on 5/4 with sweet flag leaves in the water. In many places men took sweet-flag baths on 5/5 and then stayed outside all day, while women "owned" the house, probably a remnant of old matrilocal marriage customs according to which men traveled to meet their wives in their wives' houses. Many scholars feel the Women's House custom also reflected earlier shamanic practices according to which female shamans (most Japanese shamans were female) gathered and sang sacred songs and did private shamanic training on this day in preparation for rice-planting. For men, the day became a time to display armor and martial arts (especially archery) in competitions, and later it came to be informally known as Boys Day among members the samurai class. In Issa's hokku, some courtiers from Kyoto are visiting the Yudanaka spa complex, presumably to bathe on 5/5 and the days before and after in order to avoid sickness during the coming hot season. The spa was located near the Nakasendo inland road from Kyoto to Edo, so it was accessible to Kyoto people. No doubt the hot baths at the spas have leaves of sweet flag soaking in the water, and leaves of sweet flag, mugwort, and other herbs hang from the eaves. In 1815 lunar 5/5 fell on June 11, so the nights mentioned in the hokku are truly becoming shorter and shorter just before the solstice. The image of short summer nights comes from waka, where it commonly indicates that summer nights are all-too-short to do something important, such as being with a lover. Issa's hokku, however, isn't about love. It seems filled with irony instead, since for spa owners summer was a slack season. As the nights get shorter, the days get hotter, and fewer customers visit the hot springs, which are most popular in fall and winter. The owners may have made great efforts to get courtiers to visit for the 5/5 festival and at other times during the summer to help take up some of the slack. The spas in Yudanaka are located just below several high mountains, so Issa must be referring to the mountain above the spa he's in, so the mountain may be an indirect way of referring to the spa itself. He uses an honorific prefix for the mountain (o-), making it "honorable mountain," a common usage when speaking of a mountain. However, Issa seems to be using o- in two different senses to create satire here. On the literal level, the nights are growing short and fewer customers come, but the dignity and awesomeness of the mountain and the spa on it are actually increasing, since prestigious courtiers from the imperial court in Kyoto are bathing here now. Perhaps Issa overhears some courtiers or spa attendants saying exactly this kind of thing. However, even if courtiers and commoners are bathing in different baths, in a hot bath there are no perceptible differences between a commoner and an aristocrat, and Issa probably has no special respect for the courtiers, who are simply the descendents of an elite that once ruled the country centuries earlier. Likewise, those who run the hot springs no doubt respect mainly the money the courtiers bring bring in during the summer off-season, not their class status, which is higher than that of commoners and in real terms below that of warriors. With the honorific o- Issa implicitly contrasts the respect he and others feel for the mountain with the artificially imposed, formal respect commoners are forced to show to courtiers by, for example, using honorific language. Telling the mountain it should feel honored to have courtiers staying there is an indirect but ironic comment on the emptiness of the high status the courtiers enjoy. The humor is based on the fact that warriors are the real lords now, and the power of courtiers and the emperor are radically limited and consist mostly of displaying elegant symbols from the past. Many courtiers in Issa's time had to sell family heirlooms in order to stay out of poverty, and it's possible the spa has had to give the "high-class" courtiers special discounts so they could visit.
. First Kick-Ball Game (mari hajime 鞠初) .